A recording of 25 works dedicated to Marlene Lemay, in celebration of the 25th anniversary of the publishing house Les Productions d'OZ. 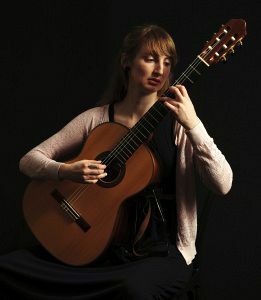 Born in 1990, Marlène Demers-Lemay began studying the guitar at age 11 with Claude Gagnon, in Quebec City, Canada. In 2012 she was awarded a Bacherlor degree in music performance from the University of Ottawa, where she studied in the studio of Patrick Roux. In 2011 she released her first solo recording, “25”, by the publishing house Les productions d’Oz, featuring 25 original pieces by 25 different contemporary composers specially commissioned for the project. In 2011 we celebrated the 25th anniversary of the publishing house Les Productions d'OZ. In 2009, I invited 25 of our composers to write an original piece for this event. All of them accepted immediately, with great enthusiasm, and it was the beginning of a beautiful journey. I entrusted my daughter, Marléne Lemay, to bring to life these compositions, both on this recording and on stage, knowing that she would display her wonderful talent. When she was born in 1990, I dedicated my guitar method to her with the citation: "To Marléne, for whom everything begins." Today, after more than 20 years, it is 25 composers from around the world who are dedicating their pieces to her. What could be more gratifying and stimulating for a publisher than having such a wonderful project as this, with composers, a special performer, and dear friends involved in the creation of a book and recording! For their precious collaboration, I want to thank Claude Gagnon for his contribution to the recording production, Patrick Roux for his teaching support, Frédéric Pascal for his craft in sound recording, Éric Dussault for his advice and ideas, Antoine Bégin for the production of the book and CD, my partner Diane for her support, and my daughter Marléne for her dedication and artistic sensibility. Finally, I want to express my gratitude to the 25 composers, for all of their pieces that, when brought together, become a musical bouquet that will always have a special place in my heart. Recipient of numerous awards and scholarships, Marléne Lemay is establishing herself as a promising young guitarist, and Les Productions d'OZ is very proud to be associated with this talented artist.